During the Charli XCX interview find out how the singer describes herself as an artist, why she started writing and making music at age 14, what her signature song is and how “1999” came to fruition. Sophia Lenore: Charli XCX! How are you, beautiful? How are you doing today? Charli XCX: I am good. How are you? Sophia Lenore: I am very very good! I am happy that it is nice and sunny! I am happy I am here with you! And thank you so much for your time. I am looking forward to ask you a few questions. Charli XCX: Awesome. Let’s do it! Sophia Lenore: So let’s jump on in. So, Charli XCX, if you want to describe the artist or if you want someone to describe you as an artist, what would you say could be the definition of this artist Charli XCX? Who is Charli XCX? Charli XCX: They would be like… she is the best artist in the world who parties the hardest with the coolest songs about partying. That’s probably what they would say. What Does the XCX Stand For? Sophia Lenore: And XCX…what does it stand for (if someone doesn’t already know)? Charli XCX: Weeeell, XCX is kind of a word I made up. It can really mean anything you want it to mean. It can be personal to you, it can be personal to me. It can be really anything. You can just take this word and apply it to anything. I really hope that one day it would be in a dictionary as like an official word that can mean anything you want it to mean. It can be a feeling, a sound. XCX can become whatever you want it to be. That is pretty and magical. Sophia Lenore: I like it. You create your own word, your dictionary. Charli XCX: Yeah, my language. Sophia Lenore: I have to say I did my research on you and…you started writing songs around 14 years old, which is so dope and amazing…and I have to say, really impressive. Because at 14 you are just admiring music, you are not thinking: “Oh, I think I can do that better” or “I can make that my career”. So please tell me what did urge you into not just being a listener and admirer of music, but then thinking and wanting to write yourself. 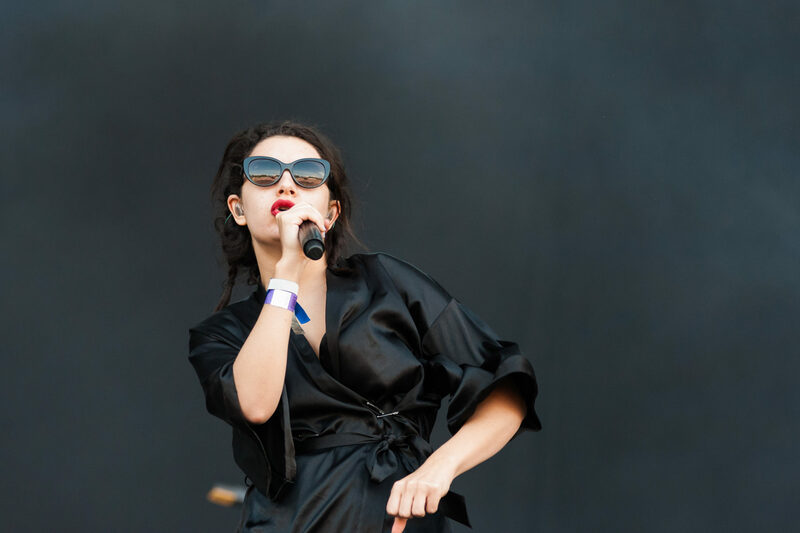 Charli XCX: Well, it definitely did start with being an admirer of music. When I was younger, I was trying to create or recreate the sounds of people who I really loved. I didn’t have my own identity as an artist, but I was kind of a discoverer. I think the reason I wanted to make music is just because it made me feel cool. I tried to escape from the normality of my everyday life. I was always imagining playing crazy parties, playing in different countries, while still staying in my parent’s house, in my bedroom. I think the reason I want to make music was this kind of escapism, like fantasy world I could access when I was doing it. Sophia Lenore: I can imagine that. There probably also was a lot of influence from the music videos coming out. I just feel your videos are just very different from what I see on TV. I like that you have a very different interpretation of your own songs. When I listen to the song I have a vision how I think the video is gonna be…but I never can predict it when it comes to your music. You have such dope visuals. Sophia Lenore: When you look at your body of work, at your songs, which you have written or just recorded, what would you think or what would you say is your signature song or what song personify Charli XCX? Charli XCX: I think it is the song called “Girls’ Night Out” which is quite classical me. Because it is a pop song, it is a little bit unexpected, but in the same time is very familiar and it is about partying. Sophia Lenore: Now I need to get into the song that I’ve been listening the whole morning doing my makeup and getting dressed. 1999! This is the top collaboration of the year between yourself and Troye Sivan. I need to know because this song is hella nostalgic. I love your vocals on this track. How did you come up with this track and let me know how did Troye become a passenger on this journey? Charli XCX: This song started at the beginning of the year and came out in March-April. I just had an idea to write a song called 1999. I thought it was a funny and catchy title that would have a lot of interesting ways to explore it through music videos. It is not about me being super nostalgic for wanting to go back to those times. Although I do love the 90s I wanted to be like Britney Spears or one of the Spice Girls. I was kind of obsessed with that time, but it is not like super literally. I just wanted to make a fun song called 1999 and this is what came out. Troye got on it because I had sent a song to him. We met a few years ago at a house party that I threw. We just go on and we realized that we got a lot of the same friends, we were working with a lot of the same people. We are equally admiring of each others work. I really love the songs he released, particularly his latest album “Bloom”. I think it is such an incredible album. He likes some of the work I’ve done. So we just said that we gonna do something together one day. And then this song came about…and it ended up being this. Sophia Lenore: That is pretty! It is a really dope song I have to say. I feel like it is a bit different for him. Charli XCX: Yeah! I think it is definitely out of his comfort zone. But he really crushed it. He sounds so amazing on the verse and he wrote it really great. So…please, tell me, is there a music video, concert, performance that stand out most in your mind or in your life that you either experienced yourself or experienced as a viewer in the audience that really impacted you? Charli XCX: I think, few things. I did see the Spice Girls when I was younger. That was my first concert. I don’t remember lots about it but I remember being in this huge space filled with people. I remember there were so many signs. I remember the car was parked really far away. I remember Jerry had just left and there were only four of them. It was literally the day she left. So it was really sad and I cried a lot through the concert. But still it was amazing. And as I said I grew up listening to them so it was pretty incredible. Sophia Lenore: Ah yeah, it was a time when they were still touring without Jerry. Charli XCX: Yes, it was a while. I think, they did few more songs without her. Sophia Lenore: So I am gonna go with a little bit of fashion. Fashion questions! What is your signature style in fashion or what designer brands do you wear? Why are they your favorites? Charli XCX: I think my style can change depending on my mood. But I think it is a little bit of tomboyish in there. I was wearing things that have harder edges and sometimes I combine it with something which is softer. It is definitely something like 90s throwback things in my look. But I really dress for my mood. If I am in a really happy mood, I would probably wear something that is louder and colorful, the shape is more diverse. Like I am having a big personality. But if I am just chill out, I would wear something that is probably all black, narrow. And some of my favorite designers are Balenciaga cause I love the shapes. I think it is pretty amazing. Also, Gucci and so many others. Sophia Lenore: Are you stuck in a time for any particular decade overall in your style though? Charli XCX: I think definitely the 90s. Sophia Lenore: I heard a reference once that your style is a bit Mariah Carey “The 90s” in moments. Charli XCX: In moments, sure! She definitely wore some really cute stuff. I think I took from a lot of people from the 90s, like Drew Barrymore in the 90s in “Rent Poison Ivy”, Alicia Silverstone in “Crush”. That were some great movie characters in the 90s like Rose Mcgowan in “Doom Generation”. That was my dream wardrobe; I just wanted to take it all. There were a lot of great movie characters which I looked at for fashion tips. Sophia Lenore: I’m just gonna close with one really-breezy one. What do you like to do during your free time or when you have time off? Is it something particular you love to do or that you look forward doing, when you have time off coming around the corner? Charli XCX: I really like going away. I like going on trips with friends, exploring something new. I like road trips. I also like watching movies. Going to the cinema or just staying at home and watching a movie. I have a whole list of movies that I want to see that I am always adding to. I really like being in water like swimming, but it doesn’t matter what to do, just being in water. Sophia Lenore: I was just thinking that you gonna say that “I just like to be at a good party”. Charli XCX: Yeah, and that…and partying…but it happens when I don’t even have time off. Sophia Lenore: That comes with the job sometimes. That is all I’m gonna ask you for today. I am so intrigued and I am so in love with this new project. I can’t wait to see that is gonna to come. If you have anything coming up that you want tease out to our viewers about or you have something on a horizon. Charli XCX: You know, I really don’t. I am very much stuck in 1999 right now and that is where my head is at. Sophia Lenore: And this is the song that I want everyone to listen to…this song is so dope. This is the collaboration of the year. So, Charli, thank you so much for your time. Thank you so much for this single. I am looking forward for more hits. I am looking forward for more albums and see you again. Charli XCX: Yeah! You too!